I was in Fairbanks on Thursday for a business trip. Having flown into town in the morning and leaving the same day, the trip was quick but very productive. However, the sun was out and it felt like summer. 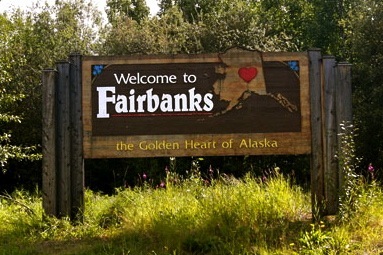 The temperature in Fairbanks was about 70 degrees, which is about 20 degrees warmer than it has been in Anchorage. My previous trips to Fairbanks have occurred in January (2 trips), February (1 trip) and March (1 trip). So, being able to enjoy the warmer spring temperatures (compared to temperatures that ranged from -60F to -10F) was very nice. Interestingly, Fairbanks has the greatest range of temperature from winter to summer in the world...dipping down to -60F in the winter and reaching 100F in the summer...a difference of almost 160 degrees. In between meetings with Interior Community Health Center and Fairbanks Memorial Hospital, we enjoyed lunch at the Pita Place. Only open during the summer, the Pita Place served very authentic falafels and pitas...perhaps the best I have tasted since traveling to the Middle East in 2006. All of the toppings and condiments were prepared with a Middle Eastern touch. I also found out that the pitas are made in an imported Israeli pita oven. Can you get more authentic? In Fairbanks, AK? I hope you had a great Thursday! !